200 square miles and over 240 species of birds brings some of the best wildlife viewing in the Midwest. Bird and Wildlife Sightings abound in the Northwoods! Northern Minnesota is host to a multitude of recreation opportunities, from hiking and skiing, to boating and fishing, to one of the fastest growing outdoor recreation activities: Bird and Wildlife Watching! It is harder to predict good places to find wildlife, so while bird watching keep your eyes out for mammals like moose, wolves, bobcat, fisher, pine marten, or even flying squirrels that frequent the locations listed below! Porcupines can be found in the trees, otters can be seen in the rivers or lakes of the area, and black bear can be seen lumbering through the woodlands. Do watch for the ever present white-tailed deer along the roads and listen for red squirrels scolding from the tree tops as you wander the woodland trails. Due to the diversity of wildlife, it can be hard to find a place to start! St. Louis County plays host to diverse ecosystems, including diverse lowland conifer forests, swamps and bogs, old growth pine forests, mature riverine forests, and of course lakes. With such diversity it is no wonder that 376 species of bird have been found in the county, with over 200 of those species nesting through the length and breadth of the county. As big as St. Louis County is, it may be a daunting task to know where to start, especially away from the Duluth area! Read on for a few suggestions near the Iron Range to find some truly special species! Download or request maps here. The Sax-Zim Bog is a world renowned birding location in the winter, as well as the spring and summer. In the winter months, the Sax-Zim Bog is an important wintering area for many Arctic Breeding species, such as Pine Grosbeaks, Common and Hoary Redpolls, Northern Shrike, Rough-legged Hawks, Northern Hawk Owls, and occasionally Boreal Owl and American Three-toed Woodpecker. Most of these avian visitors will leave by the middle of March for their breeding grounds in Northern Canada. Many of the 2500+ human visitors during the winter come to see birds best found with snow on the ground, but can be found in the summer months as well. Birds like Great Gray Owl, Black-backed Woodpecker, Boreal Chickadee, Evening Grosbeak, and Sharp-tailed Grouse call the meadows, forests, and bogs home all year long. Though the bulk of visitors to the Sax-Zim Bog come in the winter, the spring and summer are fine times to visit, as long as you remember your bug spray! 19 species of warbler nest in the Sax-Zim Bog, including boreal forest and bog specialists like Connecticut Warbler, Pine Warbler, and Palm Warbler. The Sax-Zim Bog also hosts a robust population of Golden-winged Warblers, with along with Connecticut Warbler, are in need of conservation attention as they have experienced significant population declines in recent time. The Sax-Zim Bog also hold bog specialist species like Lincoln’s Sparrow and Gray Jay, prairie specialists like Bobolink, LeConte’s Sparrow, and Sedge Wren. As you can see, the bird diversity abounds in any season! Welcome Center opens this year December 8 – daily 10 a.m to 3 p.m.
To get more information, to find a birding map, or to keep track of the latest sightings, check out the Friends of Sax-Zim Bog Website: http://saxzim.org/. Email for more information: info@saxzim.org. There are two little known bird watching gems in the center of the city of Virginia: Silver Lake and Baily Lake! These can be a great place to bird watch during spring and fall migration, especially for waterfowl. During the winter, driving the streets of Virginia, Eveleth, and Biwabik may offer up winter time species like Pine Grosbeak, Bohemian Waxwing, or Evening Grosbeak, as well as other winter finches. Because of the proximity of the Range to the Superior National Forest, the Virginia offers an abundance of birdwatching opportunities for the person who wants to venture down Forest Service Roads and explore and under birded area of the state of Minnesota. For those looking to expand their birdwatching adventure to the north or the east, the areas around Cook and Orr, as well as the Ely area offer great birdwatching opportunities for hard to find boreal forest species like Boreal Chickadee, Spruce Grouse, Red and White-winged Crossbill, and Gray Jay. You will have to cover some ground to get to each of these areas, but it could be worth your time! Johnson Road, near Cook, MN is a great location to find Spruce Grouse, Black-backed Woodpecker, Gray Jay, and Boreal Chickadee. 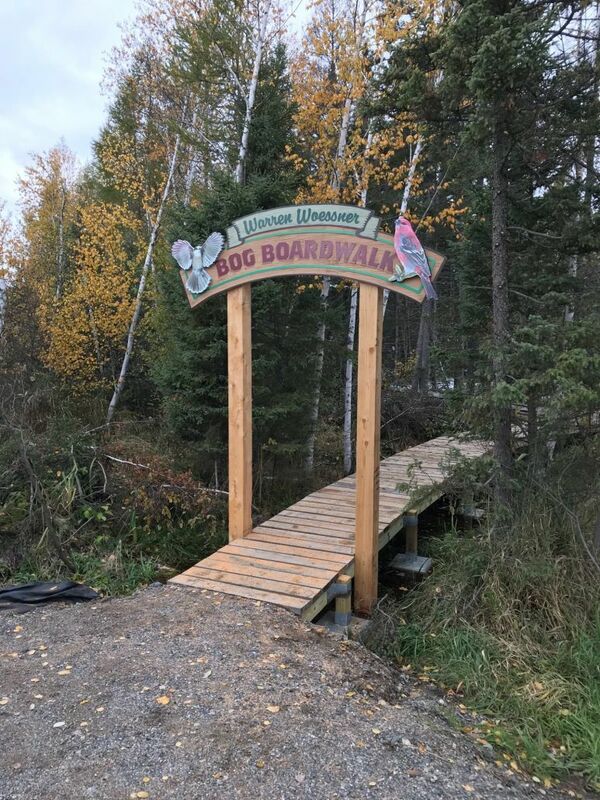 The Mickey Elverum Bog Boardwalk in Orr is another wonderful hike, as well as a great area to find Black-backed woodpecker and a number of warbler species. For the Ely area, check out the Ely Field Naturalists website: https://elyfieldnaturalists.wordpress.com/.